On a cold, rainy night in April 2007 I traveled with CTMD artistic director Ethel Raim by subway to Astoria, Queens to interview Greek Island singer Amalia Papastefanou at Dahdoo Productions’ studios. Studio director Richard Khuzami and HellasFM radio producer and host Athanasios (Thanasis) Tzouvelis welcomed us warmly, ushered us inside, and introduced us to Amalia and her sons Christos and Yianni. We presented Amalia with a bouquet of yellow roses, thanks in advance for the songs we hoped she might share, along with her story. Amalia had dressed simply and elegantly for the occasion, in rich earth tones. A carefully chosen textured scarf graced her neck. Her eyes sparkled, acknowledging our collective attention, while her delicate smile conveyed a quiet reserve. Thanasis gladly translated our questions and Amalia’s answers. The interview, like the recording Amalia was about to release after a lifetime of glorious traditional Greek singing, was a homecoming—to the solicitous tenderness and pride her sons displayed in accompanying her to the studio, and to the same enthusiasm and praise her singing first inspired in the Greece of her youth. 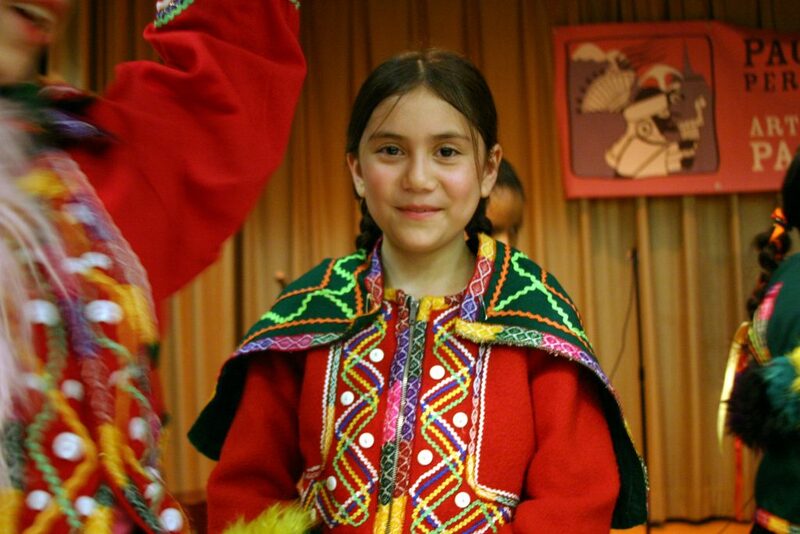 Amalia Christodoulakis was only twelve when neighbors and friends on the island of Rhodes began to realize they would need to work together to bring this young girl the broader attention her exceptionally sweet-sounding and expressive voice so richly deserved. In the 1940s and early 50s, professional singing was still frowned upon in Greece for women and girls unaccompanied in public venues, so Amalia’s father, Christos Christodoulakis, instead brought select visitors into the family home. In the home, under his watchful eye, guests could meet the family and hear his daughter sing. In this way local musicians, including the island’s finest violinist, Ilias Vasilarakis, became aware of Amalia’s talent. With her parents’ permission, they invited her to sing with them at private, rather than public venues–weddings or name-day celebrations. “It’s an honor to the place you visit, to go there and sing,” Thanasis translated. The usual instrumental accompaniment, according to Amalia, included santouri (hammered dulcimer), violin, and laouto (lute) or guitars, which were often more available than the laouto. Eventually, local musicians arranged for Amalia to travel in the company of her mother, Maria, to the government-run radio station in Rhodes. There, for a program broadcasted once a week over a period of two years on Radio Rhodes, Amalia sang the traditional songs she had learned within her family and community: wedding songs, songs of love and courtship, and songs of xenitia—loosely translated, the mutual pain of immigration felt by those leaving as well as those left behind. Thus, while still a teenager, Amalia created a legacy of recorded radio broadcasts which became, and remain in Greece today, a national treasure. The committee received her songs with excitement and invited her to start singing for Radio Athens right away. Within a year Amalia was contacted by a more established Radio Athens singer, Domna Samiou, who took Amalia under her wing. She introduced her to Phillips Fidelity studios in Athens, where Amalia would record her first album of twelve songs, selected from the repertoire that had been received so enthusiastically from her first Rhodes radio broadcasts. Songs from this album and from the Rhodes broadcasts are still aired on Greek radio today, Thanasis affirmed. “There is no Greek singer, male or female, who has not recorded the songs from Amalia’s first album.” The songs Amalia said she loves most and thinks of as most truly “her own,” insofar as traditional songs ever belong to a particular person, are two from her first recording: the leave-taking immigration song addressed to a mother from a daughter, “Djivaeri”, and the island song sung for newlyweds, awakening at dawn after their wedding, “Mera Merose.” Amalia graciously sang both songs for us that rainy April night in Queens. Like her mother and her grandmother before her, Amalia found her voice in a fully traditional world of song: smyrneika–the music and songs of the refugees of Asia Minor, brought back from Smyrna to Greece in the 1920s, later popularized in Greek recordings of the 1930s, and nisiotika—the songs and dance rhythms characteristic of the Greek islands, including the Dodecanese, where Amalia was raised. Her first vocal exemplars were her mother, grandmother, and other people originally from Asia Minor. Her family was among the one and a half million ethnic Greeks, mainly women and children, who returned as refugees to Greece after being forcibly expelled from Asia Minor (now Turkey) after the Greco-Turkish War in 1922. Amalia’s mother Maria and her grandmother could orally compose—create lyrics spontaneously by arranging and rearranging the wealth of traditional turns of phrase, images, scenes, and rhymes that are the building blocks of song, setting these instantly to traditional melodies. Smyrneika lyrics are typically sorrowful, laments set to highly melismatic tunes influenced by the Arabic-Turkish system of modes and scales known as maqam. Amalia’s influences in nisiotika, beyond the musicians and singers in her own island community, included recorded island singers Irini Konitopoulou-Legaki, Anna and Emilia Hadjidaki, and Anna Karabesini. Amalia protested that she was never as skilled as her mother in spontaneous oral composition, but admitted that she could still memorize a song after only one hearing. She inherited a repertoire of songs so large that when we asked her how long she would be singing if she sang all the songs she knew—she could only laugh! Modestly, she admitted she usually sings for three hours straight when accompanying Greek dances in the New York area, though she could continue longer. Ethel asked Amalia to describe which dance forms she accompanies with island songs. These include the isios horos and the sousta, in forms specific to Rhodes, one in particular from a village called Bouniatis. Karpathos, Rhodes, and Crete all dance the sousta, Amalia explained, in different versions. She took her son Yianni’s hand, lifted it to shoulder level, and they stood up, singing, to demonstrate how the island songs–nisiotika–and island dance steps go together. Thanasis and others crowded with us into the small interview room at the studio tapped their feet softly, keeping the beat. On the way to the first broadcast sessions at Radio Rhodes, Amalia’s mother put the family’s oral composition skills to work for her daughter. During the trip to the station, Maria would improvise fresh lyrics, set to the old melodies. Amalia would listen to her mother’s improvised songs just one time and then sing them on the air! Twelve songs from this early Rhodes radio period and one brilliant first album later, Amalia’s recording career had only just begun. So had her new family. Now married to Panagiotis Papastefanou, Amalia had had her sons Kosta and Christos by 1967, the year she would emigrate, to unite their young family with her husband’s extended family, all of whom had already emigrated to the United States. Yianni, her youngest son, who would grow into a professional singer in his own right, was born in 1970, in the new land. And so, in 1967, Amalia’s discographic history apparently had ended. However, as her sons affirm, the singing went on, uninterrupted. In the Papastefanou household, as in the Christodoulakis household years before, mother and children continued to “sing every day.” Amalia admits that the first ten years in the United States were difficult. In those days, return trips to Greece, even placing a phonecall back to the family, were impossible. Not knowing English, tending to young children, separated from family, friends, and her blossoming career as a recording artist, Amalia felt isolated and wished she could return to Greece. Eventually Amalia learned English and made new friends, but in the interim, she says, reassuring letters from her mother, and singing the songs of xenitia—the pain of the absence from home—were a great consolation. She sang the old songs to forget her sorrows, and was cheered further when she met people in the United States who already knew her by having heard her songs on the radio back in Greece. And as time passed, Amalia found herself freer in New York to perform in a wider variety of venues–in Greek church choruses, at weddings, for Greek dances, and at many other community, even public, events. When we lived in California for two years, [Yianni] must have been, two years old. Still in diapers. I remember him crying, going down—it was a condominium—going down the stairs. I remember the manager coming out and saying, If you don’t silence that child, you’re going to have to move out! He’s just too loud! Yianni has a very powerful voice…like my mother. And the first time that Yianni ever sang, he was with my mother in Canada. And it was a large hall…there must have been 2,000 people. It was packed. And he’d been practicing and practicing, so my mother took him up and he sang one song, and we coaxed him on, and everybody went crazy with his voice and they said more, more, more! But of course he only knew one song, so he started the song again! And in the middle of the song the microphone cord fell off…and somebody from the audience jumped up and they put it back in for him, and he sang the song again. After that, it was just a continuation. Today, Amalia’s son Yianni has become a well-known singer of traditional and contemporary Greek song in the New York area. He credits his mother with his success. The brothers proudly report that Christos’ six-year-old daughter Eleni Maria has begun to learn her grandmother’s songs and has already performed in public. So the tradition continues, now spanning five generations of traditional Greek singers in one family. One of Amalia’s most knowledgeable admirers, Athanasios Tzouvelis emigrated from Sparta to New York in 1975. 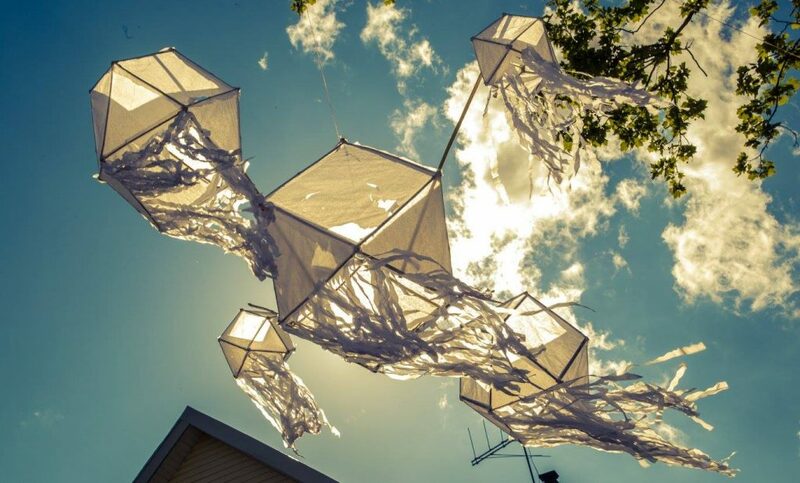 (Thanasis is also known in the New York Greek community by his artistic name on radio, Alexandros Velmos.) He was amazed and thrilled to recognize Amalia and hear her singing at a community celebration in New York’s Crystal Palace in 1978. He determined then that he would find a way to interview her and broadcast her songs again on radio. Through the friendship with Tzouvelis, who eventually interviewed her and enabled her to sing on HellasFM radio (www.hellasfm.us), Amalia met Richard Khuzami, world music/middle-eastern percussionist and producer at Dahdoo Productions. 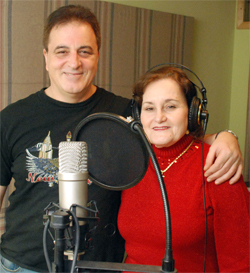 Together, Tzouvelis, Khuzami, Yiannis Anastasopoulos, and the staff at Dahdoo assisted Amalia in producing her first recording after more than forty-five years, the first and only CD release of her traditional songs in the United States–still sung so expressively in the old island style. The release of this new and historic recording has been timed to coincide with Amalia’s performance at this year’s New York World Festival. So it is with pride that the Center for Traditional Music and Dance, the World Music Institute, Central Park SummerStage, Dahdoo Productions, HellasFM Radio, and Amalia’s many friends and family members invite you to hear her sing on Sunday, September 16th at Central Park SummerStage (Rumsey Playfield, mid-park at 69th Street), as part of the New York World Festival:Music Around the Mediterranean, featuring the rich traditions of Morocco, Greece, and Spain. Amalia will perform Greek island repertoire (nisiotika) with Vasilis Patrikis on violin and John Themelis on laouto, master clarinetist Lefteris Bournias, keyboardist/music director Yiannis Anastasopoulos, Mavrothis Kontanis on oud, Richard Khuzami on percussion, and guest vocals by Amalia’s son Yiannis Papastefanou. The festival line-up includes Hassan Hakmoun performing ecstatic music and dance from Moroccan Gnawa trance ceremonies; the Orchestra of Tangier, a leading Moroccan ensemble specializing in Andalusian music, under the direction of Ahmed Zaitouni; Pontic lyravirtuoso Christos Tiktapanidis performing soulful melodies and energetic dance tunes; and the masked Dimonis d’Albopàs, from the Balearic Islands of Spain, who will open the show with a festive and colorful parade of masked “demons,” drummers, and bagpipers. The program also includes two pre-concert Artist Encounters–a 1:30 workshop on Moroccan Gnawa music with Hassan Hakmoun, and a 2:15 workshop on Greek dance from the Dodecanese islands with Demetri Tashie and other instructors affiliated with the Greek American Folklore Society. Please join us in celebrating Amalia’s homecoming in song, and the release of her long-awaited new CD.